Yes. Numbers are very ironic with this game. The backbone to the story in Call of Duty: Black Ops has our hero, Mason, annoyingly interrogated throughout the game. He slips in and out of consciousness flashing back to different moments a la Assassins Creed (in a way). I have a few problems with this. One; Immediately I don't feel like I'm in control. There is no tension. I mean... If I'm dying in his flashback or memory did he do the same? Am I changing his memory of what happened? What is this? The movie Inception? It takes me out of the experience. There is no tension at all. Two; watching any interrogation is awful. Usually in games or movies it lasts for a few moments (See: James Bond, Casino Royal or any and every episode of Alias. Yeah, I said Alias!) In this game it happens after ever objective. So, like, every 15 mins or so WHAM!zzzzapWEEEE... back to the dark room getting shocked with a muffled voice asking about the NUMBERS. The game has the hallmarks of previous COD games I've played going all the way back to the original COD that I played on my iMac. I like the action formula they use. However, that was Infinity Ward putting that together. This one is Treyarch. And I gotta say... it doesn't work. The gameplay formula is there, which is enjoyable. But everything else; music, SFX, even voice acting (save for one Gary Oldman) is sub-par. Ice Cube is worn out and the guy from Avatar (Sam Worthington), who voices the main character can't... get... the numbers out of his head. Not often I care about this, but he struggles with an American accent. Graphics and Art are muddled. FX graphics are horrible ('splosions and the like). I feel like I'm floating and not walking, I could go on. I didn't expect this game to be Helltown's Game of the Year but I felt since I had given this prize to one of it's past sister games I at least gave it a shot. It gets 31% score from me. It is #72 out of 89 games I have bothered to assign my arbitrary numbers to since I started me blog. If you add a zero to my 31 score you get 310. Add the word Million to the end of that and that is the amount of money this game made on opening day. It broke every opening day entertainment release in history. That includes the movie Avatar. It's all about the numbers! Zing! For a final note on the game; I thought that taking on real covert operations that have been declassified could have worked and been really interesting. It isn't here. It is a lost opportunity. The perfect metaphor for the game was a scene set in Vietnam where you are piloting a swift boad. "Woods" turns on the radio and you hear the Rolling Stones "Sympathy for the Devil". A moment that, man, should have worked because it had the right ingredients. But didn't. 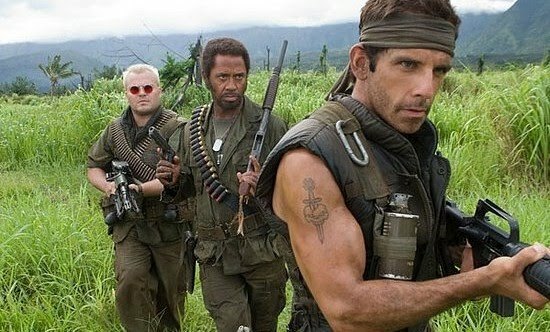 Above: Picture of Tugg Speedman from Tropic Thunder. Below: Woods from COD: Black Ops. Keep it original Treyarch. I literally chucked when this character appeared on screen. Nice effort there. hi anonymous. thanks for dropping by. this post gets a lot of attention to this day. not exactly sure why. a good game i guess.